Space is a hot commodity in our house. Some of our poor hall closets have been repurposed five times in as many years. One was Cedar’s “nursery” since we knew she’d sleep in our room for at least the first year. And one even got absorbed into a recent room remodel. So when it came time to commit to a homeschool space, of course, I was scoping out the weary closets. I imagined a rolling cart of some sort that would appear during the day and disappear when we were finished. Then I remember a time when Scott and I were first married and had the tiniest kitchen space ever. It was when we lived in the haunted farmhouse. Have I ever mentioned that place? No matter. We needed a place for two to eat. And we needed compact storage. On a crazy impulse, I bought a china hutch that had a murphy-bed-ish table. It seemed the perfect solution. And it was. Only it turned into our first REALLY awful, REALLY big marital argument. Something about making big purchases without talking to the other person first. Yada, yada. It would not be our last argument. As time passed, the table was removed from the hutch, the chairs went to other rooms, and the hutch became merely a hutch. I repurposed as my homeschool hideaway. I think it will suit. I can fold the table up when we’re not using the space to keep the destructive curious two-year old out. Don’t think I don’t hear you veteran homeschool moms laughing. Of course, I realize that soon my hideaway will spill out into the house and yard. I know my house will reek of homeschool when guests come over for dinner. But a girl can try, right? Posted in Learning at Home and tagged homeschool, project corner, small-space homeschool. Bookmark the permalink. I love this idea Julie! We did something similar by cleaning out the drawers of our china cabinet and filling them with our homeschooling necessities. I can’t wait to read more about your homeschooling journey. Ooh, I love your little corner! Our homeschool stuff is just everywhere. We don’t even sit at the table, just in the floor with our books. I need to clean out our coat closet, but there is still no way it’ll hold all the stuff. I might put some of it on top of a bookshelf later. Oh well, at least Suzi seems to like it! I love this! And I’m not laughing at all 🙂 We did start out with a small area. But, we’ve grown to an IKEA Expedit bookshelf and a large white table! 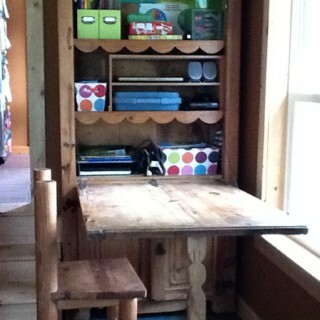 I love your homeschool cabinet, but I must admit I also love the way homeschool spills over into everyday life. Books everywhere, science experiments laying around…constant learning that’s not compartmentalized or separated from normal life. A significant chunk of our days are now spent in the car line, waiting so Samuel can go somewhere and “learn.” Ugh.